When you are traveling to Florida, you may wonder how to experience the great outdoors. New Smyrna Florida Inshore Fishing is the ultimate way to do so. North Florida holds some excellent water for catching a variety of species. Come enjoy this beautiful region on an New Smyrna Florida Fishing Charter for Trophy Redfish. Now is the time to cash in on the action. Our local experts have years of experience in catching inshore species. If you are looking to learn some new techniques and tips to catch more fish, our experts can help you. Captain Brad Kayholm is your local expert in the Edgewater, Daytona and New Smyrna Beach area. 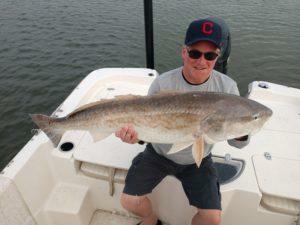 If you are looking to catch big redfish, Captain Brad is the man to fish with. When you come out inshore fishing, never worry about sea sickness. Calm waters and lots of fun activities are what make inshore fishing exciting. Captain Brad had the pleasure of fishing with his repeat client Joe. It was an awesome morning filled with action from the redfish. Joe started off the day with one of the best fish of the trip. You can count on some hard fighting fish when you adventure out of North Florida. New Smyrna is a key destination for catching nice redfish. 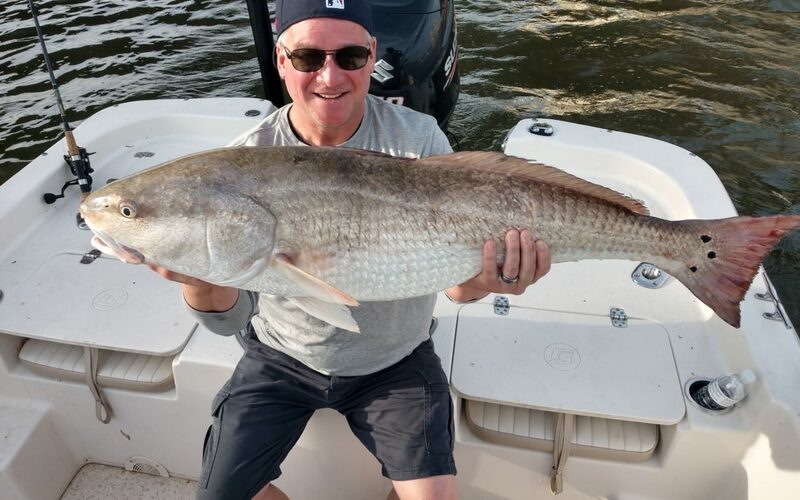 Joe caught a 42” Redfish, which is considered a trophy or bull redfish. The bite was absolutely exceptional on this fishing charter. We found the right area that the redfish were stacked in and they kept coming to the boat. You will not find a redfish bite like this anywhere else in Florida. North Florida is one of the best locations to plan your next inshore fishing trip. Joe had a blast and could not keep up with the action. Fish after fish created a permanent smile on his face. He is looking forward to the next opportunity to get out inshore fishing in New Smyrna. Captain Brad will be glad to be part of it again! Don’t miss out on your inshore fishing adventure! You never know what you are going to catch and what you can get yourself into. Bring your family, friends and loved ones along on a fishing adventure of a lifetime. We look forward to seeing you on the water next time in North Florida. If you enjoyed this post about New Smyrna Saltwater Fishing, you might also enjoy our Fishing Blogs.